Vancouver, BC – June 30, 2011. 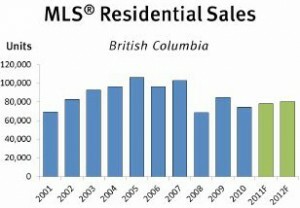 The British Columbia Real Estate Association (BCREA) released its 2011 Second Quarter Housing Forecast today. 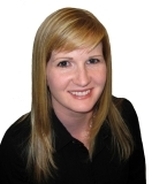 A moderate increase in housing demand is expected this year and next. After declining 12 per cent in 2010, residential unit sales through the Multiple Listing Service® (MLS®) in BC are forecast to rise by 5 per cent to 78,200 units in 2011 and a further 3 per cent to 80,700 units in 2012. 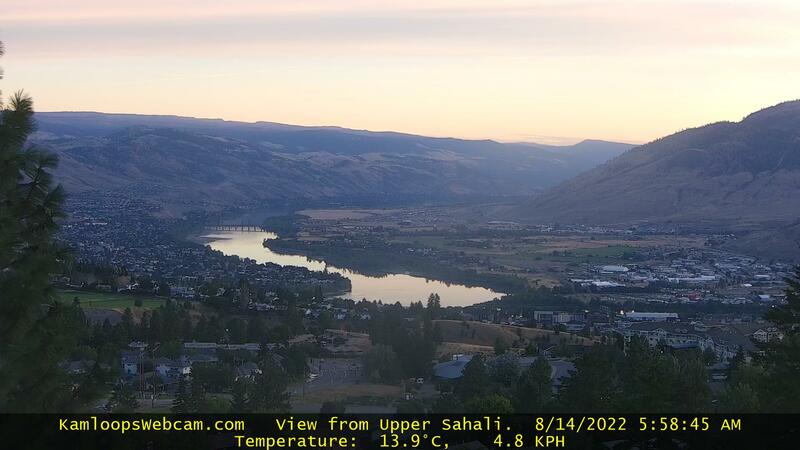 However, BC home sales will remain below their 10-year average of 87,600 units both this year and next as expected higher mortgage interest rates in the second half of this year and through 2012 will counterbalance stronger economic fundamentals. Despite lackluster performance during the first quarter, BC employment is expected to increase 1.4 per cent this year and 2.3 per cent next year after posting 1.7 per cent growth in 2010. Recent figures indicate many part-time jobs are being rolled into fulltime employment, signaling increased employer confidence. Real GDP growth is forecast to increase 2.7 per cent this year, after an estimated Olympicsized 3.7 per cent boost in 2010. Improvement in the US economy as well as robust trade with Asia is expected to expand the economy by 3 per cent in 2012. Average home prices in the province have climbed dramatically this year, despite more normalized consumer demand. The upward skewing of average price data is the result of a change in regional demand patterns and a shift in the mix of home types sold rather than as a result of a return to pre-recession market froth. As a result, the average annual BC MLS® residential price is forecast to increase 13 per cent to $571,000 this year, before edging back 2.5 per cent to $557,000 in 2012. 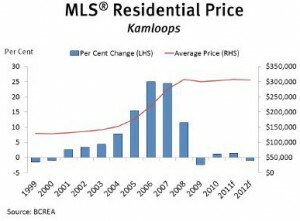 However, the price of a typical home in BC is expected to remain relatively unchanged through the balance of this year and through 2012. New listing activity this spring ebbed alongside a lull in consumer demand, keeping supply conditions in check in most markets. Going forward, Vancouver and the Fraser Valley are expected to trend toward the margin of sellers’ to balanced market conditions over the next 18 months, while the rest of the province exhibits buyers’ to balanced market conditions. The BC economy lost a little momentum towards the end of 2010, but incoming data suggests that it is still expanding at close to its trend rate of growth.Employment in BC was unexpectedly weak early in the year. Through the first three months of 2011, the economy managed to create only 3,500 jobs, while the provincial unemployment rate increased to an average of 8.4 per cent during the first quarter. Job creation has picked up in recent months, though unemployment remains elevated at 7.6 per cent. Weaker employment along with a spike in energy prices cut into household budgets, precipitating some weakness in retail sales growth. 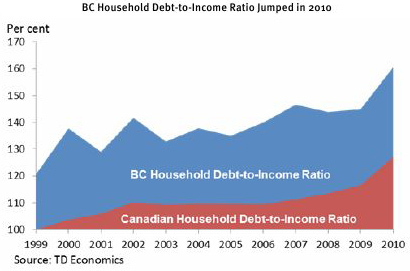 Although we anticipate that consumer spending will strengthen as employment growth resumes, the high level of household debt in BC could be problematic as interest rates rise. BC has always been somewhat of a special case when it comes to household debt and common measures of financial vulnerability have been at high levels for several years without introducing any instability into the provincial economy. Even so, the significant uptick in the provincial debt-to-income ratio, at a time when interest rates are due to rise, does present a risk to economic growth and should necessitate a rebalancing of household finances in coming years. Even with consumers potentially taking a break from spending, other sectors of the economy are growing. The BC manufacturing sector started the year strong with the forestry sector benefiting from Asia Pacific demand. The rebound in manufacturing and trade has greatly benefited from the global economic recovery becoming more entrenched, and the United States finally producing more solid growth in both output and employment. Moreover, the composition of BC exports is undergoing important changes, primarily driven by a greater proportion of BC goods being shipped to China and other high-growth markets. trade dampening effect of slower than expected growth in the United States and a Canadian dollar trading above parity. However, increased demand from China and relatively high commodity prices should, nevertheless, provide a boost to growth. Overall, we anticipate real GDP growth of 2.7 per cent this year, down from an estimated 3.7 growth rate in 2010. We expect this year’s moderation in growth to be temporary, with growth accelerating to 3 per cent in 2012 as the United States economy continues to strengthen and trade with Asia further develops. New home construction in 2011 will be supported by an expanding BC economy and an associated uptick in employment. However, continued uncertainty around BC’s Harmonized Sales Tax (HST) as well as tighter mortgage credit will provide an offsetting influence. In addition, elevated inventory levels in some regions of the province will act as a drag on some new building activity this year. We expect that new home construction will remain relatively flat in 2011, albeit rising slightly from 26,769 units in 2010 to 27,000 units this year. Strong demographic trends in BC continue to favour a solid pace of construction activity in the years ahead, with particular strength in the construction of multi-family units as the lower-mainland experiences robust growth in new households. Exuberant pre-recession building has given way to caution in the past two years and, as a result, there is a widening gap between expected household formation and growth in the housing stock. We anticipate that the necessary reversal of this gap will help to push starts higher in 2012 to a level of 28,100 units. Single family housing starts are expected to stay close to long-term average levels, reaching 11,000 units in 2011 and 10,500 units in 2012. 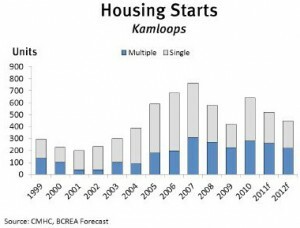 A strong trend in multi-family housing is expected to continue, with multi-family starts of 16,000 forecast for 2011 and 17,600 units projected for 2012. Mortgage rates in the second quarter evolved in-line with our March forecast, with the five-year fixed rate reaching as high as 5.69 per cent and the one-year rate hitting 3.7 per cent. However, global financial markets are increasingly being defined by gyration between a “risk-on” (high demand for risky assets) versus “risk-off” (high demand for risk-free assets) paradigm. Given the current replay of last year’s Greece driven Euro-crisis and disappointing economic data in the United States, markets are currently in a distinctly “risk-off” mode with capital pouring into risk-free assets and driving bond yields in Canada to year-to-date lows. This downward pressure on government bond yields prompted a recent reduction in the five-year fixed yield to 5.39 per cent. to higher mortgage rates, likely in the realm of 4.2 per cent for a oneyear and 5.8 per cent for a five-year fixed rate mortgage by the end of the year. 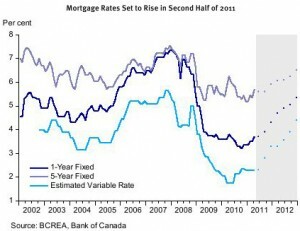 Given the Bank of Canada’s current outlook for growth and inflation, the target overnight rate should increase gradually beginning in the third quarter of 2011, approaching 3 per cent by the end of 2012. However, the latest flare up over European sovereign debt and a stream of weak United States economic data may send up a caution flag to the Bank of Canada. Indeed, markets are already pricing in a more cautious Bank of Canada. Derivatives that trade off of the Bank’s overnight rate are currently pricing in only 50 basis points of interest rate tightening over the next nine months. We anticipate that the Bank will resume raising interest rates earlier, and in greater magnitude than the market currently expects. That said, it is becoming increasingly likely that the current global economic climate will push rate hikes into the fall rather than the summer as we previously expected. Our forecast is for the Bank to bring its overnight rate from 1 per cent to between 1.5 and 1.75 per cent by the end of 2011 and to 3 per cent by the end of 2012.
his year. The average MLS® residential price in Kamloops is forecast to rise 1.4 per cent this year to $308,000, after increasing 1.2 per cent in 2010. Next year, the average MLS® residential price is forecast to remain relatively unchanged, albeit edging down 1 per cent to $305,000. After climbing 53 per cent to 641 units in 2010 on the strength of an 85 per cent increase in multiple construction activity, housing starts are forecast to dip 19 per cent to 520 units this year. A moderate oversupply in the multiple market has developers increasingly cautious of adding to inventories. Housing starts are expected to remain at a more conservative level through 2012, with foundations poured on 450 homes.